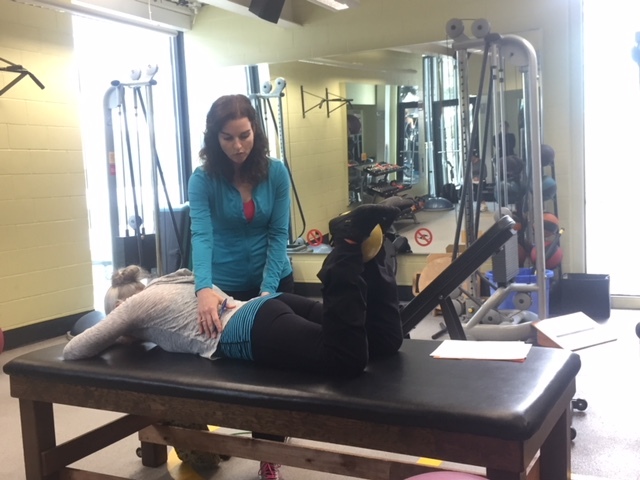 If you are post hip replacement surgery and at least 6-8 weeks post operation, there are specific hip strength exercises and stretches you will want to be doing weekly to recover strong! I wanted to share a case scenario with all of you on what exercises are needed post hip replacement operation. The hip exercises I chose to help his hip flexibility, strength, gait, and balance. How you can relate this to yourself is assess which of these concerns relate to you and then try each hip strength and stretch exercise yourself 3-4 times a week. Here are the hip strength exercises I gave him to improve his gait, endurance, hip extension, and balance. The following exercises were chosen due to his short stride, dependence on a cane and walker, his lack of balance, and limited hip extension flexibility. 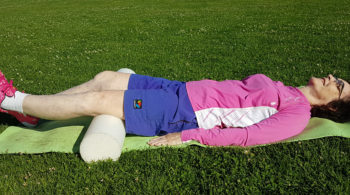 Clam Shell side lying with a foam block between knees 10 repetitions and 2 sets. Gradually increase to 12-15 repetitions. 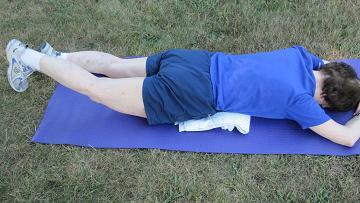 Hip extension lying prone on your stomach setting your core and extending straight leg with foot flexed. 10 repetitions to start and 2 sets of 10 on the operated leg with one set of 10 on the non operated leg. Gradually increase to 12-15 repetitions as your body allows. Bridge lift with small squeeze ball above knees. Lying on back feet hip-width apart and arms bent so only your elbows are touching, set your core in and squeeze your seat muscles to lift up into a bridge. Pause at the top or hold for only a few seconds, then lower down keeping your core engaged as you lower. 12-15 repetitions and start with one set increasing to 2. Set up a hard, secure chair near a wall where it will not slide and add cushions or foam blocks to a height that you can stand up from and where your hip joint angle is 90 degrees or above when seated. Feet hip width apart and sitting forward on the chair, perhaps with arms out in front, stand up. Lower back down to the chair without using your arms or hands and without dropping down. Control your sit down with the strength of your legs. We then added in the Calf Raise to foster better heel-toe transfer when walking. To do this stand near something to hold onto like a counter or even a table or wall. Start this exercise on both feet with feet hip-width apart. You are not holding on and the calf raise is going up onto your tip toes and then back down onto your heal. Repeat this 10-15 times. After time you will be able to progress to single leg calf raise. If you are not able to walk without a can or walker yet, we not only need to strengthen your muscles, but we also need to improve your balance and retrain your gait. I did the following exercises with my client where I was right there by his side spotting him, so make sure you have someone there for you too while you try these! High Knee Walking regular stride where you feel balanced or on the spot without moving. I call this one Buckingham Palace marching. Opposite arm and leg swing walking. This helps people who may have lost their arm swing while walking. Practice swinging and ensuring it is your opposite arm to leg while you walk. Lengthened stride walking where you still feel in control, but where you take a longer stride than you have been. This should be safe and feel balanced and only extend to a manageable stride for you! We did backwards walking together, but I do not advise you do this on your own. You will most definitely need a spotter and a wall to touch for support when and if needed. This walking is where you reach back with one foot and touch down with your toes and then push down to your heel. Calf Stretch standing by wall pushing back heel to the floor and leaning in toward the wall. It is important to bend the front knee and keep the back leg straight with this one. I also added in a dynamic range of motion stretches to loosen the hips in standing position and using the arms as drivers to lengthen. Balance Exercises post hip replacement surgery to improve your balance! Balance exercises can be tricky to know when to implement as there is the timeline guideline of about 8 weeks; however, I find this to be very individualized and dependent on both hip strength and body size. You need to have good hip strength prior to trying the one leg balance which means you need to have performed hip strength exercises for weeks before attempting this. If you are a larger frame person whether that be in muscle, height, or weight, you will actually require stronger hip muscles before attempting the one leg balance. What happens or how do you know if it is too soon? You will experience pain either during or most likely afterwards. Please monitor yourself and listen to your own body. The best one leg balance exercise for hip replacement is positioning yourself near a counter or something stable to hold onto and then after you have set your core and squeezed your seat muscles, lift one leg holding for 3 – 5 seconds to start. This is important to do with a spotter the first time you try it. This is a snapshot of only a handful of exercises we have implemented for this client’s concern. Many of these issues are common for everyone who has had a hip replacement surgery and should be exercised that are implemented post operation. The key here to understand and know for yourself is that in under 2 weeks of this post hip replacement exercise training program, my client was walking better and stronger, went from walking with his walker to his cane and unassisted around the house, was able to walk a longer distance, has improved his balance, and has increased his hip strength and range of motion in extension. Go give some of these exercises a try at home and if you need more details on how to do them correctly, how many repetitions to do and pictures to see a visual demonstration and/or video, take a look at the complete Hip Arthritis and Hip Replacement Exercise program. Let’s get you back to walking better, stronger post surgery for independence, and back to your daily activities and life!